The map below shows in a nutshell the routes we took during our week's adventure. We flew from Sacramento to SeaTac airport and then by smaller turboprop to Spokane on October 25. Spokane is upper right at the top of the blue line. On the map you can now see that we went by bus (blue line) on October 26 south to Clarkston then Lewiston. We boarded the Sea Bird in Lewiston at about 4:30 p.m. on the 26th but took our first sea voyage in a jet boat south down the Snake River in Hell's Canyon (red line) on October 27. The boat turned around at the south end of the red line and returned to the Sea Bird at its dock in Lewiston. That evening and night the Sea Bird continued north on the Snake River and followed it as it turned west toward the Pacific Ocean (yellow line). The next day (Oct. 28) we arrived at the intersection of the Snake and Columbia Rivers at 5:00 p.m. (on the dot, according to my camera). We were supposed to have explored the basalt cliffs on the Paloose River on the 28th but it was way too windy for the kayaks and five Zodiak boats (part of the Sea Bird's equipment) we were going to use. 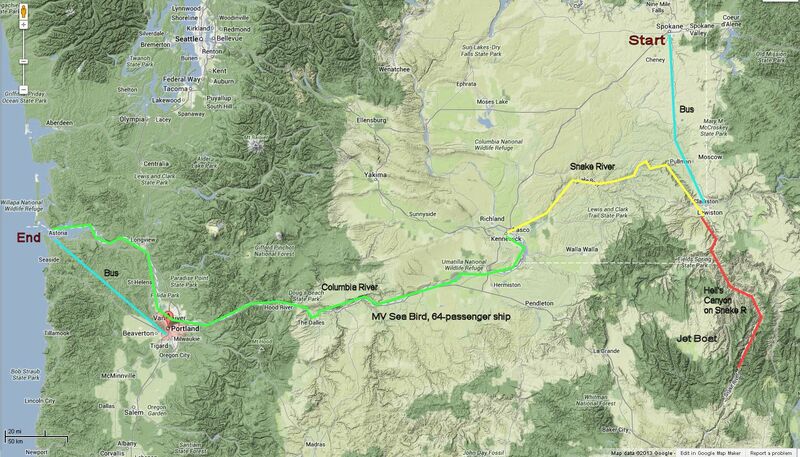 That night the Sea Bird continued west on the Columbia River heading toward The Dalles. At The Dalles the next morning (October 29) we stopped at the Columbia Gorge Discovery Center to explore this wonderful museum. Then I biked the six miles back along the river to the Sea Bird with a scattered group of about 10 of us. The bikes were first class and delivered to us at the Discovery Center. Most of the others in the 59-member tour group opted to visit Maryhill Museum instead. The next morning, October 30, the Sea Bird proceeded the short distance to Hood River where we visited a family farm and had views of both Mt. Hood and Mt. Adams. Then we drove into the Columbia River Gorge to see beautiful Multnomah Falls. That evening and night the Sea Bird made a beeline west along the Columbia River toward Astoria on the coast. On October 31 we stopped at Fort Clatsop where the Lewis and Clark expedition spent the winter. Then on to the Columbia River Maritime Museum (boring) and disembark on November 1. Two buses took us back to Portland airport (the blue line).